The following products are available for you to purchase in this section of our online store. If you would like to purchase a product listed, please click on the ADD TO CART button below. To learn more about any product, click on the MORE INFO button (In the case of an e-learning product you will also be able to read an overview of the course study programme). This is a NON certification EXPERIENCE program for anyone wishing to experience the thrill of trying scuba diving. Purchase your theoretical course here and now and contact a RAID Dive Centre about their cost to complete your practical training for this course. The Junior Scuba Diver program provides you with basic knowledge of scuba diving. For age groups between 10 and 11 years old only with legal guardian consent. Age group 12 years and older purchase the Scuba Diver course. The maximum teaching depth of 12m or 39ft and certifies you to dive with the accompaniment of a Dive Professional. Purchase your theoretical course here and now and contact a RAID Dive Centre about their cost to complete your practical training for this course. Junior Open Water Diver (Diver training programme) for age groups between 10 and 11 years old with legal guardian consent. Age group 12 years and older - must purchase the Open Water 20 course. This is the academic section only. Contact a RAID Dive Centre about their cost to complete your practical training for this course. The Scuba Diver program provides you with basic knowledge of scuba diving. Ages 12 years old and above may purchase this course. The maximum depth of 12m or 39ft and certifies you to dive with the accompaniment of a Dive Professional. Purchase your theoretical course here and now and contact a RAID Dive Centre about their cost to complete your practical training for this course. RAIDaptive OW20 Diver training for persons with physical challenges to learn how to SCUBA dive within their capabilities and where required with assistance. Purchase your theoretical course here and now and contact a RAID Dive Center about their cost to complete your practical training for this course. Start here, learn to scuba dive, the RAID Open Water 20 Diver course, the most popular and widely recognized scuba course. Dive with your buddy to a max depth of 20m / 66ft. If you are 12 years or above, you can start today. Purchase your theoretical course here and now and contact a RAID Dive Centre about their cost to complete your practical training for this course. Junior Explore 30 Diver this is a great next step in your diver training for age groups between 12 and 14 years old with legal guardian consent. Purchase your theoretical course here and now and contact a RAID Dive Centre about their cost to complete your practical training for this course. The RAID Explorer 30 course is an exciting, fun programme designed to increase your skills and understanding of the important core areas of diving. Purchase your theoretical course here and now and contact a RAID Dive Centre about their cost to complete your practical training for this course. This program is designed to teach persons the safe methods of diving open circuit scuba to a maximum depth of 35m / 115ft and Minimum age 15 years. OC Try Dive Instructor (Diver training programme) To gain the RAID Try Dive Instructor rating, provided you are a qualified RAID Instructor, all you need do is complete the on-line training. Once the theory has been completed you can simply contact the RRO and an IT/Examiner can sign them off if appropriate. All RAID Instructors are currently qualified to teach the Try Dive program but we strongly recommend they complete the on line Try Dive Instructor Course. Master Instructor (Diver training programme) This rating is in recognition of high standing in the dive industry. It is for dive professionals who have a high level of experience, a high level of training, and a high level of completed certifications. Those that who exemplify the essence of the RAID system. Try Rebreather Dive (EXPERIENCE) This is a NON certification programme for persons who wish to try rebreather diving. Your introduction into the closed circuit rebreather world -enjoy a Bubble Free and new sound sensation! As a RAID Discover Rebreather participant you will savour every moment of the three dimensional weightless environment. The bubble free rebreather will open a sound exhilaration to the under water world. Meet other adventurers who share your quest for unending excitement of new technologies. This is your first step into the world of diving, and you may read or hear some stories about all sorts of dangers, but in reality there are far more dangers in every day life, which you may take for granted, like driving a car. Few people have the fortune to be part of the wonders and inter actions that is scuba diving. Rebreather diving is a sport the family can all do together, with the options of a calm, slow and peaceful dive or an adrenaline, intense exploration. There is no substitute for the actual sensation and experience of being underwater and doing it. To get your certification you need to read all the PDF manuals for each section and complete the Quick Quiz. To pass you need 100%, but do not stress, as it is an open book Quiz and so is the final exam which requires 80% pass mark. Before writing the exam log out & back in to ensure you do not expired page! When you have passed all the Quick Quiz questions, move on to the final exam. During this time, contact a RAID Dive Centre (Under My Dive Centre) and arrange for the practical in water training and ask them to help you with equipment advice or purchases. Complete the Rebreather Speciality for the unit you are going to learn on just the same way as the core Rebreather Level 1. These are open book exams and you need to research the material to find out the correct answers yourself! Incorrect answers are provided, once you have passed; simply click on the "VIEW" button next to the score mark to read through and see the correct answers. Once you finish the final exam you are ready for the in water training. You know that you may complete the confined water training with the local RAID Dive Centre and the open water training at a tropical island RAID Dive Centre. The choice is yours! HAVE FUN! To be a minimum of 15 years old or as stated in the Rebreather Speciality Programme. Centre for approval prior to any in water training. Completed and passed the core level 1 academic section, Quick Quiz and Exam. Rebreather: Complete the academic section of a RAID Rebreather programme. The Level 2 programme builds on your experience and develops the understanding and skills to dive deeper, whilst working on the fundamental skill of buoyancy control. This does not detract from the fun the programme has installed, such as, the Search and Discovery section and learning about the aquatic realm. If you have joined RAID for the first time or you have completed Level 1 to review the procedure: Read all the PDF documents and then complete the Quick Quiz. It is open book so don't stress. When finished all the Quick Quiz questions, complete the final exam. If you do not get a pass re-read the section you are not comfortable with or contact the local RAID Dive Centre found under My Dive Centre and ask for help. You may attempt the questions many times, and once you have passed then move on to the next. This is an open book exam and you need to research the material to find out the correct answers yourself! Before writing the exam log out & back in to ensure you do not get expired page/time! Before finishing the final exam make contact with a RAID Dive Centre and arrange to complete the in water training once you have passed the exam. Remember, in water training may be complete all with one RAID Dive Centre or split between confined water training with the local centre and open water at another centre, the choice is yours. Completed and passed Level 2 academic section Quick Quiz and Exam. Have a minimum of 6 hours logged in water time (confined and openwater) on a rebreather. Have a RAID Level 1 or equivalent certification from a recognised training agency and/or complete, to the satisfaction of the instructor, the minimum in water rebreather Level 1 skills. The instructor is to evaluate these skills. RAID rebreather Speciality certification or equivalent certification from a recognised training agency. Complete in addition to the Core Level 2 training:- the academic section, Quick Quiz and Exam of a RAID Rebreather Speciality programme. This Level does not cater for open circuit cross over to rebreather. Rescue invokes the epic dramas as only television and films can sensationalize as the average human has a fascination with tragedy of others. Is it for the fame and or the sympathy received for a brief period? Whatever the reason, there is another saying Not on my watch! An airline pilot, whilst interviewed on television, was asked how many successful flights he has had to which he replied you mean landings don't you? With the scuba diver, anyone can put on SCUBA and descend underwater, that is generally not the quandary. The ability to safely stay underwater and more importantly to return to the surface, therein lays the predicament. The next question that needs to be asked is the action worth the risk? Considering today's action risk statistics, relating to many, sometimes inconsequential activities, for which we accept without thought everyday, the answer is a resolute - yes. Even though the statistics show diving as a low risk, it is still not a risk to take for granted, and anybody who thinks otherwise should not be diving. Like the airline pilot, how many safe ascents have you had? What is a good rescue? One that is not required, because of all the preparation and forethought that has been taken into account, the necessity is not needed. Unfortunately, even with thorough preparation accidents still happen. Familiarity breeds contempt and therein lays the fault; the laxity of divers. Have a minimum of 15 hours logged in water time (confined and openwater) on a rebreather. Have a RAID Level 2 or equivalent certification from a recognised training agency and/or complete, to the satisfaction of the instructor, the minimum in water rebreather Level 2 skills. The instructor is to evaluate these skills. Complete and pass, in addition to the core rebreather Level 3 training, the academic Quick Quiz and Exam sections of a RAID Rebreather Speciality programme. To submit Deep (limited depth 30m/66 ft), Night/Restricted Visibility, Navigation, Search and Discovery certificate and/or equivalent. To be certified for at least 6 months. Open Circuit minimum 25 logged hours underwater or 50 logged dives underwater using open circuit, of which 7 logged hours or 15 logged dives shall be whilst diving with nitrox and 5 logged hours or 10 logged dives are between 27-40 m/89-132 ft. Submit an open circuit Rescue or higher certification from a recognised training agency. To submit Deep (limited depth 40m/132 ft), Night/Restricted Visibility, Navigation, Nitrox certification from a recognised training agency and at the instructor's discretion complete the Search and Discovery navigation skills as detailed in the RAID Level 2 programme. Comply with the prerequisites of the rebreather (to be used) Speciality programme. Complete on-line RAID Rebreather academic core rebreather Levels 1, 2 and 3 programmes. Complete and pass the Quick Quiz and Exam of the academic section of a rebreather Speciality and the rebreather Level 3 programmes. What is a Level 4 Dive Master? Is it the badge? Is it the need for another qualification to add to the list? Well we hope not, the Level 4 programme is a continuation from the Level 3 Rescue Training; developing the Problem Management Skills from the review of rescue skills which can never be over emphasized, to the development of the Divers Skill Demonstration and Assisting a RAID Instructor, with a few things thrown in for education. The main feature of this Level of training is your attitude. The best course in the world will not show results if your heart and commitment is not there. Be the master of the mind, rather than mastered by the mind - Zen saying. Starting this Level, you must have the belief and enthusiasm which is needed, but the true test is in the long run, and maintaining the position of 'master of the mind'! Completed and passed Level 4 academic section Quick Quiz and Exam. Have a minimum of 35 hours logged in water time (confined and openwater) on a rebreather of which at least 6 hours are carrying a side sling alternate air source. Have a RAID Level 3 or equivalent certification from a recognised training agency and/or complete, to the satisfaction of the instructor, the minimum in water rebreather Level 3 skills. The instructor is to evaluate these skills. To submit Navigation, Night/Restricted Visibility, and Deep certificates (of which at least 5 hours are between 27- 40 m/89-132 ft) and/or equivalent. Submit a current Rescue Breathing/CPR Training and Oxygen Provider certificate. (DAN/equivalent). This Level does not cater for open circuit cross over to rebreather. Only Level 3 allows experienced open circuit divers to enter the programme/cross over to be certified to dive rebreathers. This qualification confirms that a RAID Sport Rebreather Instructor can teach from Level 1 to Level 4. After successfully completing the Instructor Course and exams, instructors take responsibility for teaching divers to scuba dive with RAID registered rebreather specialty programmes. 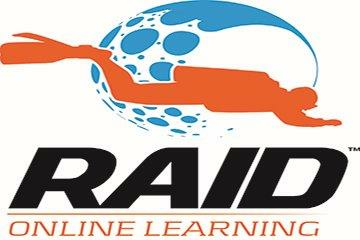 A RAID instructor is a leader and educator, developing and growing with the RAID diver education system in a dynamic environment. Always learning and able to adapt to changes, providing leadership and understanding, with commitment to professionalism. The instructor development programme builds and extends the skills learned and mastered from supervisory, problem management and prevention level (Level 4) to an educator with the responsibilities of developing not only academic understanding but motor skills in a very unforgiving environment (underwater) where mistakes are not easily tolerated. This programme also reviews handling customer services, business and operation management and dive leadership. This is an open book exam and you need to research the material to find out the correct answers yourself! Before writing the exam log out and back in to ensure you do not get expired page/time! Completed and passed RAID Rebreather Levels 1, 2, 3 and Instructor academic sections Quick Quiz and Exams. Completed at least one RAID Rebreather Speciality programme/s. To be certified as a RAID dive master and/or equivalent. To have the required logged hours on a Rebreather as detailed in the RAID Rebreather Instructor Speciality programme/s. Have at least 20 logged hours carrying a side sling alternate air source whilst using a rebreather. To submit Navigation, Night/Restricted Visibility and Deep certificates (of which at least 10 hours are between 27-40 m/89-132 ft) or equivalent. To submit a RAID Rebreather Level 3 Rescue certificate, and/or equivalent and/or complete, to the satisfaction of the Instructor Trainer, the in water skills of the RAID Rebreather Level 3 programme, whilst carrying a side sling alternative air source cylinder. (It is highly recommended to do the core Rebreather Level 3 course in full). Subject to the prerequisites of a rebreather Speciality programme/s. Completed and passed RAID Rebreather Level 3 and Instructor academic sections Quick Quiz and Exams. To be a certified rebreather instructor from a recognised training agency. Have at least 20 logged hours or 40 logged dives carrying a side sling alternate air source whilst using a rebreather. To submit Navigation, Night/Restricted Visibility and Deep certificates (of which at least 10 hours logged or 20 logged dives are between 27-40 m/89-132 ft) or equivalent. To submit a RAID Level 3 Rescue certificate, and/or equivalent and/or complete, to the satisfaction of the Instructor Trainer if required, the in water skills of the core Rebreather. Level 3 course, whilst carrying a side sling alternative air source cylinder. Submit a current Rescue Breathing/CPR Training and Oxygen Provider Instructor or higher certificates. (DAN/equivalent). Complete on-line at least one RAID Rebreather Speciality programme/s that the cross over instructor is already certified by a recognised training agency to teach. At the discretion of RAID HQ and/or Dive Centre or Instructor Trainer complete a practical cross over programme. To be a certified RAID Speciality Rebreather dive/user. To be a certified RAID Open Circuit Instructor. Have at least 20 logged hours carrying a side sling alternate air source. This is the highest instructor qualification in the RAID system. Application, directly to RAID HQ, by RAID Speciality Instructors, renewed Instructor Trainers and/or Course Directors from recognized training agencies will be considered. This programme requires application directly to RAID Head Office where the assessment of application will receive consideration, dependent upon, but not limited to area requirements and applicants' credentials. The RAID Instructor Trainer is one of the main representatives of RAID system and leads by example through the professionalism of a dedicated educator. To be a minimum of 21 years old. To be a renewed RAID Rebreather Instructor for at least 12 months. To have the required logged hours on a Rebreather as detailed in the RAID Rebreather Instructor Trainer Speciality programme/s. To have a minimum of 40 hours carrying a side sling alternate air source. To have certified a minimum of 25 students between RAID Levels 1 to levels 4, of which 15 certifications are for Rebreather levels. Submit a current Rescue Breathing/CPR and Oxygen Provider Instructor certificate (DAN or equivalent). Documented proof of prerequisite requirements needs to be presented to the Examiner for approval prior to any in water training. To certified as a RAID rebreather Speciality Instructor. Complete on-line the Instructor Trainer programme. To be a renewed Instructor Trainer/Course Director or higher for a recognised training agency. To have certified a minimum of 35 students from entry level to instructor, of which at least 5 certifications are instructor level. To submit a RAID Rebreather Level 3 certificate, and/or equivalent and/or complete, to the satisfaction of the Examiner, the in water skills of the CCR Rescue course, whilst carrying a side sling alternative air source cylinder. To submit RAID Navigation, Night/Restricted Visibility and Deep certificates (of which at least 40 hours are between 27-40 m/89-32 ft) or equivalent. To be certified as a RAID Sport Rebreather Instructor which requires, completing on-line academics Rebreather Levels 1, 2, 3 and Instructor. To be certified as a rebreather Speciality Instructor on at least one programme. Complete and pass the rebreather Instructor Trainer academic Quick Quiz and Exams. At the discretion of the RAID Examiner or RAID HQ complete an Instructor Trainer Development Programme (ITDP) with a RAID Examiner and/or assist with an Instructor Development Programme (IDP) with a certified Instructor Trainer and/or be evaluated during an IDP by a RAID Examiner. NOTE: the above requirements does not guarantee acceptance by RAID who has the sole decision to accept or ask for further requirements to be met. This course is designed to enhance the effectiveness of a safe level of cleanliness in systems using pure oxygen or oxygen-rich gas and details of different gas mixing (EANx/Enriched Air/Nitrox and Trimix) methods and procedures. This programme has been developed for the training in the use of the Hollis Explorer Electronic Semi Closed Rebreather for recreational diving only. Navigation is a key skill for all divers and helps to reduce stress, anxiety and confusion by giving you more confidence in knowing - Where you are, Where you are heading and how far you have travelled. The Night and Limited visibility course is an exciting, fun programme designed to provide you with the skills and knowledge to experience a different side of the underwater world. Nitrox Speciality (Diver training programme) Training skills to analyse nitrox mixes, plan nitrox dives and the procedures for performing nitrox dives. Up to a maximum 40% Oxygen content and a Ppo2 of 1.4 atm. This qualification forms part of the RAID Master Rescue Diver programme, but can also be taken as a stand alone qualification in it’s own right. As the RAIDaptive Buddy, your role is to become the arms, legs, eyes or hearing of the RAIDaptive Diver in such a way that the RAIDaptive Diver enjoys the many benefits of diving. The use of Side Mount cylinders for open circuit diving for recreational and/or technical diving. Whale Shark Speciality (Diver training programme): For certified divers and Snorkelers. This course is designed to introduce divers to the whale shark species and help the people develop an understanding and knowledge of whale shark biology and behaviour as well as learn techniques for diving with whale sharks. This programme qualifies the RAID Open Circuit Instructor to teach divers to dive to 45m/148ft and complete dives with mandatory decompression stop requirements for up to a maximum of 10 minutes including the use of Helium gas to reduce narcosis (21/27). Cave diving represents the pinnacle of advanced or technical diving. The skills and techniques required to safely plan and execute cave dives have been applied successfully to wreck, deep open water, reef, and research diving. This program has been developed by professional cave instructors who are also avid cave divers who love diving in cave. And while this program pays homage and gives respect to traditional cave training techniques and limits, it adds additional skills that RAID’s development team believes are required to execute "Full cave dives" safely, comfortably, and enjoyably. This course provides a RAID Instructor with the knowledge to instruct a RAID Advanced Wreck Specialty course. This course provides a RAID Instructor with the knowledge to instruct a RAID Boat Specialty course. This course provides a RAID Instructor with the knowledge to instruct a RAID Deep 40 Specialty course. This course is designed for Instructors to teach the effectiveness of a safe level of cleanliness in systems using pure oxygen or oxygen-rich gas and details of different gas mixing (EANx/Enriched Air/Nitrox and Trimix) methods and procedures. This course provides a RAID Instructor with the knowledge to instruct a RAID Tech Prism 2 Rebreather Specialty course. This course provides a RAID Instructor with the knowledge to instruct a RAID Tech JJ CCR Specialty course. This course provides a RAID Instructor with the knowledge to instruct a RAID Navigation Specialty course. This course provides a RAID Instructor with the knowledge to instruct a RAID Night and Limited Visibility Specialty course. This course provides a RAID Instructor with the knowledge to instruct a RAID Nitrox Specialty course. As a RAIDaptive Dive Professional, your goal while teaching the RAIDaptive Diver Program is to introduce the wonders of the underwater world to persons with disabilities. This course provides a RAID Instructor with the knowledge to instruct a RAID Search and Recovery Specialty course. This course provides a RAID Instructor with the knowledge to instruct a RAID Basic Wreck Specialty course.